Pony Meyer: 1st prize for King Me! The winning images were just 6 of 114 images entered in our inaugural Images of Research competition, and were received from students in Masters and Doctoral programs representing almost every faculty at UAlberta. Winning and semifinalist images will be showcased in an exhibition on the main floor of the Cameron Science and Technology Library through May 30, 2016. Congratulations to our winners, and all of the entrants! The Portage Network has just launched a website that will support the various components and communities central to the shared stewardship of research data in Canada. building national research data services and infrastructure. Launched in 2014 by the Canadian Association of Research Libraries, Portage works within the library community to coordinate expertise, services, and technology in research data management, seeking to collaborate with other research data management stakeholders. University of Alberta Libraries is a key partner in the development and maintenance of the DMP Assistant tool for preparing data management plans. Photo by Peter Bailey, 2015. Vice-Provost and Chief Librarian Gerald Beasley and Senior Human Resources Office Kathleen DeLong were among a large group of library directors from across Alberta who saw UAL's former Associate University Librarian Kit Wilson receive The Alberta Library's Pat Jobb Service Award at TAL's Board Meeting in Calgary on Friday, April 15. The Pat Jobb Service Award recognizes outstanding service and significant contribution to Alberta’s library community. It acknowledges the legacy of Pat Jobb, who played a leading role in the creation of The Alberta Library. In addition to Kit's highly successful career at UAL, she was seconded to TAL for a 3-year period commencing September 1, 2005, as Manager of the Lois Hole Campus Alberta Digital Library. She brought great energy, devotion and intelligence to her new challenges, and the LHCADL was the 2008 recipient of the Canadian Association of College and University Libraries Innovation Award. With typical modesty, Kit's eloquent acceptance speech attributed her success to the collaborative spirit of her TAL colleagues. You are invited to participate in the 3rd annual Research Data Management Week from May 2-6, 2016! The standards and practices relating to the management of research data are evolving. Canada's research councils are increasingly advocating for researchers to incorporate data management into their research and to make the results of the research that they fund as accessible as possible. Researchers are faced with challenges relating to ensuring data security and confidentiality while an increasing number of scholarly journals are requiring authors to provide access to the data behind their submissions for publication. Data repositories are being established in domains and institutions to support the sharing and preservation of research data, and the University of Alberta's Research Policy directly addresses the stewardship of research records, with an emphasis on the long-term preservation of data. Over 20 talks and workshops have been organized to help you better prepare for this evolving global research data ecosystem! Keynote speaker Mark Leggot, Executive Director at Research Data Canada will start the week with "The Evolving Data Landscape" (May 2nd at 10:00am). Come listen to other exciting guest speakers from Alberta Innovates: Health Solutions, The City of Edmonton, and Edmonton Public Libraries. NEW: This year Compute Canada is offering both pre & post RDM week workshops focusing upon software carpentry, as well as West Grid scheduling. 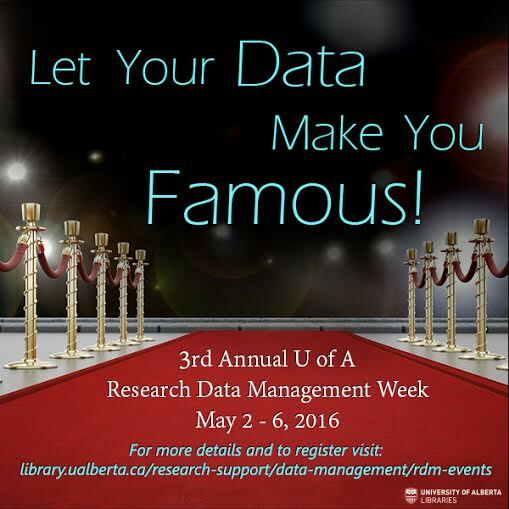 View the full Research Data Management Week schedule and register for sessions!